Don’t you find it challenging when you have a long list of renovation to be done at home and the most you are worried about is the countertops for your kitchen after all kitchen is a very important aspect in one’s lifestyle. Many a times it becomes so difficult to combine classiness and trendiness together. It is very difficult for a person to choose from a large range of countertops available in the market and the individual wishes that it could just become all easy minus the confusion all in one go. Another factor that one keeps in mind is the style of the kitchen after all who wouldn’t want to impress his friends and relatives with their unique and modern kitchen look. Well, there seems to be a solution to all the dilemmas here and that are Silestone countertops. Silestone is the synthetic material which is made up of quartz and polymer resins of which the quartz constitutes almost 95 percent of the synthetic stone and the quartz used here is highly resistant and the binding resins. The presence of quartz makes it an extraordinarily sturdy material. Silestone countertops are the only counters which are made up of bacteriostatic protection thereby giving it such hygienic properties which cannot be found elsewhere in the market. Silestone countertops is a perfect choice for bathroom countertops, kitchen countertops as well as vanity tops. 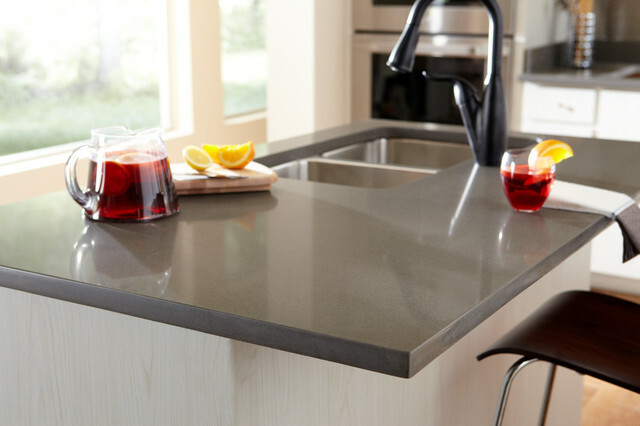 The most exciting part of these Silestone countertops is their availability in more than sixty colors and exceptional finishing. Therefore, they offer a huge number of possibilities when it comes to the selection. Silestone is a maintenance free product since it does not need any kind of sealing or polishing for long time. The durability and quality of Silestone counters gives them an edge over other counters available in the market. Another fact about these counters is that they offer great heat resistance. This sturdy and non-porous material also has an excellent resale value in the market. This virtually indestructible material cannot be stained or scratched or burnt. Therefore, it is indeed ideal for everyday use. Also, they come in the standard thickness of around three centimeter slab with a consistent pattern and color. Another essential information about these Silestone countertops is that that the price per foot is generally less when compared to other product available in the market. Great colors, high resistance, sturdiness, durability, hygienic properties and excellent reviews from the customers are the qualities that such counters have banked upon. Individuals who are looking out for a contemporary design for renovation of their kitchen or bathroom décor must analyze the qualities of these Silestone countertops since this world class product will not only bring the high qualities of quartz but also class along with it.